Nothing will give yachtie more pleasure than to visit Yaku-shima island with own sailing boat. Here is the wonderful place to visit. Not only visit the port, but also visit the mountain side. Visit even only Shiratani Unsui Ravine forty minutes away from Miyanoura. You must enjoy mystical and wonderful sense which can be experienced only at Yaku-shima. 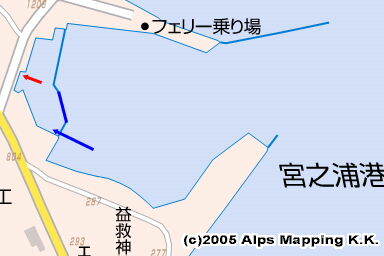 Approach: A small entrance which is leftmost close to the shore is the entrance of Miyanoura fishing port. Berth: Moor bow-to at an empty space of the fishing port in the back of the wide open port. As there is a pontoon, it is between this side of the quay and fishing boats. In my case, I moored the boat at the left side of the pontoon first. move to this nearest side of the new quay. a fishing boat came into and moored at the right side of the pontoon. the right side was OK for me. As far as the captain says yes, the controller-like would say nothing. When you moor at the pontoon, talk to Miyuki-maru. Miyanoura is convenient for shopping and living. Shopping and Coin laundry: A big shop “Yakuden” is three minutes away. Toilet in the park at hand is closed at night. Another 24-hour-open toilet with western styles is along the 10-minute-walk-awy river. A bathhouse is available for JPY 1575 at the nearest hotel three minutes away. Another is very good for JPY500 at Tashiro Annex twenty minutes walk away, which also has a bus stop. Water is available at Fisheries Cooperative office at hand. There are many restaurants. “Kabocha-ya” which is open only daytime and crowded with local people is good. Many restaurants are open only at night. “Ebisu-Daikoku Toshi” is also good with reasonable prices. 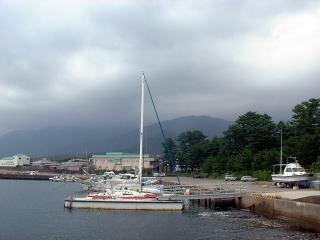 Miyanoura is centrally-located of the bus services for sightseeing and others. In all aspects of living, it is the best place in the island.